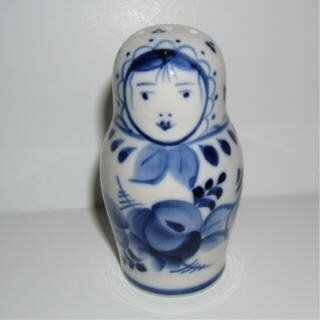 Gzhel (pronounced G-Jell) is a region about 60 kilometers south east of Moscow, famous for blue and white pottery. Gzhel pottery was first mentioned in a decree made by the Moscow Prince Ivan Kalita in 1339. At this time Gzhel artisans produced plain and enameled pottery and toys, but in the second half of the eighteenth century they mastered the art of majolica.